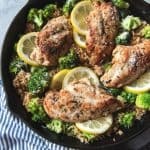 This Skillet Lemon Chicken & Rice is a quick, easy weeknight dinner that is loaded with bright, fresh flavors and made in one pan for minimal clean up and fuss! Season the chicken breasts with the salt, pepper, garlic powder, and dried parsley. In a large skillet with lid, melt the butter over medium-high heat. Cook the chicken in the butter until browned on both sides, about 2 minutes per side, then transfer to a plate. Add the rice to the pan and stir for about 1 minute to lightly toast the rice. Increase the heat to high and add the chicken broth, lemon zest, and lemon juice, scraping to release any browned bits of fond from the bottom of the pan. When the rice comes to a boil, reduce the heat to a low simmer and cover the pan. When the rice has cooked for 10 minutes, remove the lid and return the seared chicken breasts to the pan, arranging on top of the rice, along with the broccoli florets and lemon slices. Cover and cook for an additional 10 minutes until the chicken is cooked through, the rice and broccoli are tender. Sprinkle with freshly grated parmesan cheese and serve. Adapted from Creme de la Crumb.